Erected walls and built bridges not only plant deep-rooted aesthetic and economic issues into a country’s soil, but also add to various cultural and social concerns within nations and communities. Rhetorical and persuasive language, useful in everyday life, has always been a key component to political discourse and action. It is undoubtable that rhetoric has tremendous social and psychological power: it conveys a wealth of information based on emotional judgement that mars the importance of pragmatism and factual statement. This combination of pictures shows the eight prototypes of President Donald Trump's U.S.-Mexico border wall near San Diego seen from across the border from Tijuana, Mexico. Photo by Guillermo Arias. For hundreds of years, politics has concerned itself with the power of rhetorical speech. Politicians began to construct a network of shared knowledge with their audiences via rhetoric, a political jargon with which they coated their passions for the “greater good of the country” to then be reproduced, expanded upon, and maintained in the many years to come by that same society. Very recently, President Donald Trump fired up a discussion about building walls, and the good that this will do to the U.S. 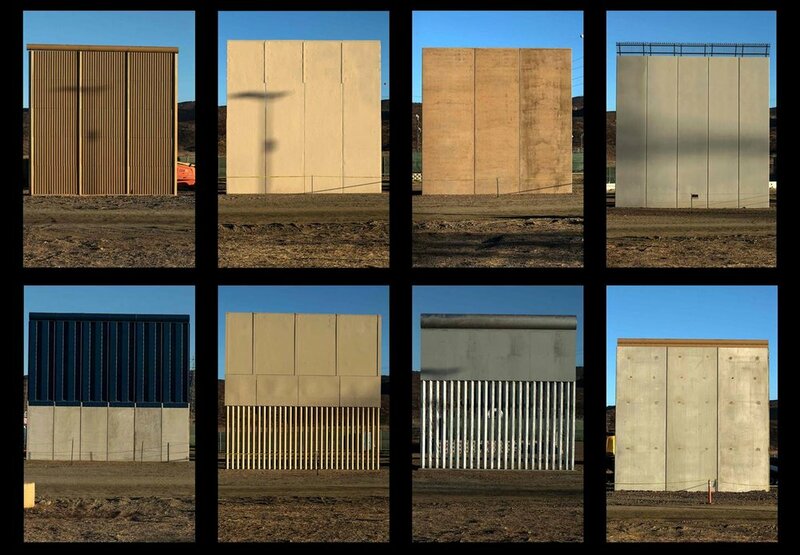 While this wall will surely visually impact the country’s borders, it must be remembered that the “wall” is not only a material object but also an immaterial one, capable of impacting ideologies globally for an extremely long period of time. Instead of dissolving borders, the rhetoric of building walls and bridges has managed to re-install a rhetoric of racism and hatred into the United States´ cultural and social space. Although walls between borders are not an unknown, such as China’s Great Wall, The Berlin Wall and Israeli’s West Bank Barrier Wall, it is peculiar that the supposed new feel of globalisation and good relations between countries is being upheld with a language that spurs on rivalry, fear, and ethnic tensions. The object of the “wall” or the “bridge” is a social object, rather than anything else – and although a practical political object in the explicit message of political speech, it is essentially the underlying linguistic reassertion of the various anxieties regarding identity and territories that then have enormous impact on a nation’s socially constructed values. The rhetoric of building walls has been, is, and will always be the transformation of an object into a political propaganda tool. Whilst conceptualising the building of walls, President Trump has also been building up heightened emotions within his supporters. His political objectives, such as “build[ing] a great wall along the Southern border” and, it “has to be quickly” at that, are channelled through a tone of security and patriotism, a simple and powerful message that skews practical judgement over misguided emotional judgement. It is unknown whether those who support the “wall” do so because it is necessary for issues such as illegal immigration, or whether it is Trump’s political reassertion via rhetorical means that was simply too much for reason to handle. For those against the US-Mexico wall, the “big, beautiful, powerful wall” has conveyed messages of fear and insecurity, a dark shadow over a nation in desperate need of positive messages. Others want to break down barriers rather than build them up again. 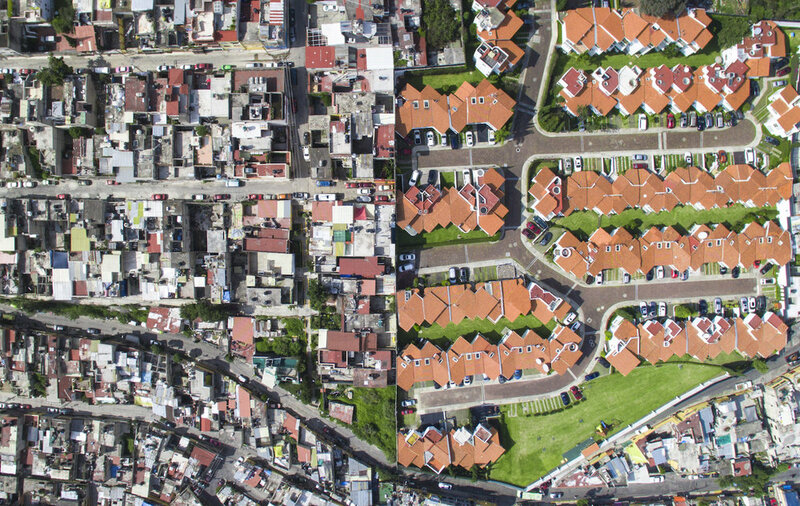 Santa Fe, Mexico City, 2016 from the series 'Unequal Scenes' by Johnny Miller. An invisible wall is already being erected as supporters of the President chant “Build that wall! Build that wall! Build that wall! Build that wall!” They justify their actions and decisions with the urgency of issues of social-security, combating drug use, ensuring economic prosperity, and so on. To these groups, the wall is necessary and imminent; what fails to be noted is that the idea is built on terror, hate, and alarm. It is much easier for President Trump to build a rhetorical wall than it is for him to build and actual wall along the border. On the one side, there are his supporters, won over by his apparently nationalistic political demeanour, and on the other, a community watching in fear, questioning how something so obvious and wrong could seem so glorious and right. The power of language can be an unfortunate thing.